All that's amazing about California is here. Paso Robles and San Luis Obispo combine coastal views and rural charm with lively cultural and culinary scenes. San Luis Obispo County offers all that’s amazing about California. The cities of Paso Robles and San Luis Obispo combine beautiful coastline and rural charm with thriving cultural and culinary scenes. North of Paso Robles, fun abounds at Lake Nacimiento, with fishing, paddleboarding, waterskiing and wildlife. There are plenty of options for secret surfing spots, but newbies should hit Pismo Beach, with rentals and lessons available by the pier. 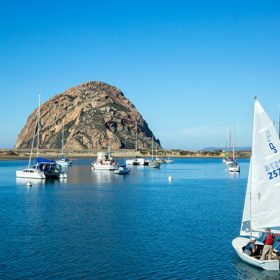 Spend a mellow day on the ocean by kayaking through Morro Bay with Central Coast Outdoors. Guides bring paddlers of all skill levels up close to birds, boats and the occasional marine mammal. Explore the hidden coves of Montaña de Oro State Park, where trails reach from the rugged shoreline to the top of Valencia Peak. Seeking an adrenaline rush? Rent an ATV or dune buggy and tear up the sand mountains at Oceano Dunes State Vehicular Recreation Area, one of the last places in California where you can drive on the beach. Trade the tasting room for a horse-drawn carriage ride through the vineyards of Pomar Junction Winery and Sarzotti Winery with White Horse Carriage Co. Stretch your legs and get a little exercise by tossing Frisbees on Castoro Cellars’ Whale Rock Disc Golf Course. Make reservations far in advance to experience the insanely creative offerings of Six Test Kitchen in Arroyo Grande. Ricky Odbert serves one 14-course menu per night to small groups inside his parents’ tricked-out garage. Sour-style beers have established a foothold in San Luis Obispo County, from the wild wackiness of Libertine Brewing Company (with tasting rooms in Morro Bay and downtown SLO) to the “Salvaje de Robles” series by BarrelHouse, and the ever-changing brews of Firestone Walker. Cider is also popular in this former apple-orchard hotspot, with category leaders like Bristols Cider House, Tin City Cider and See Canyon Hard Cider. Entertain taste buds of all ages at Jack Creek Farms, where picking berries, tomatoes or other seasonal crops can be topped off with a local honey tasting. At Gopher Glen Apple Farm, learn about dozens of apple varieties while you sip fresh-pressed cider. Re:Find Distillery changes the sustainability script by using saignée (free-run juice that’s a byproduct of winemaking) to make excellent vodka and gin. Owners Alex and Monica Villicana are also converting Paso Robles’ long-neglected Fox Theater, originally built in 1922, into their distillery. The outside marquee and other historic elements will retain the old charm. Waves of upscale accommodations have opened in recent years. On the east side of Paso Robles, the grand Allegretto Vineyard Resort comes complete with marble statuary. Just off Paso’s downtown square, the small but captivating Hotel Cheval recreates the feel of a Mediterranean village. In downtown San Luis Obispo, the brick-walled Granada Hotel offers 17 rooms as well as a spa and popular bistro. 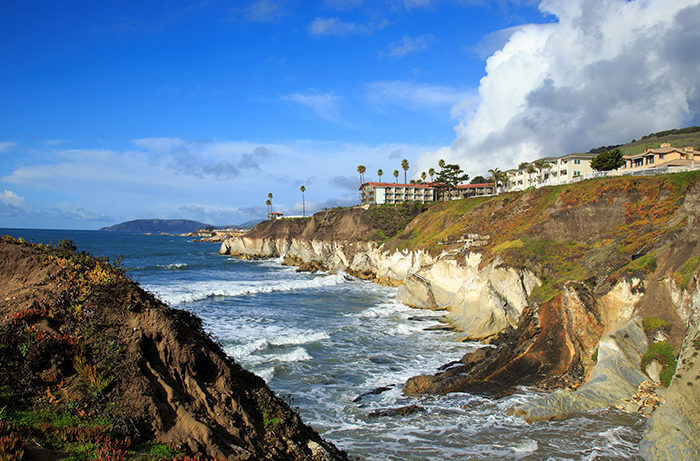 Ocean views and suite-sized rooms draw vacationers to Dolphin Bay Resort & Spa in Pismo Beach. For history buffs, San Luis Obispo’s Motel Inn, which opened in 1925, is considered America’s first lodging to use the word “motel.” The property is undergoing a lengthy renovation but may reopen in late 2017. Foremost Wine Co. / Photo courtesy of Foremost Wine Co. In downtown San Luis Obispo, this restaurant/tasting room/burrata bar showcases the cooking of young, Paris-born Julie Simon. The menu of Foremost Wine Co. reflects her latest passions, from bone marrow and potato tacos to almond-crusted pork shank confit and chicken biryani for two. Chef-owner Chris Kobayashi brought high-end dining to Paso Robles, and now his Central Coast-focused restaurant sits on one of the city’s busiest corners. The seasonal menu changes frequently at Artisan, but you can always count on flatbreads, ice cream, eclectic beers and craft cocktails. Try breakfast at his sister restaurant, Kitchenette, in Templeton. Il Cortile serves exquisitely prepared Italian, with housemade pastas from Santos MacDonal, is the draw at this ristorante hidden a half-block off the Paso square. Its “reverse” wine dinners let guests select a wine first, and then the chef pairs the food. MacDonal also serves upscale Latin cuisine down the road at La Cosecha. Ian McPhee started to elevate the Central Coast concept of steaks in 1994, and his always-buzzing restaurant on Templeton’s Wild West-like main drag sets the bar for grilled goodness. Regional legend Jim Clendenen of Au Bon Climat makes McPhee’s Grill house wines. There’s one bar in Paso Robles where everyone ends up after a certain hour—the Pine Street Saloon. Housed just off the main square in a historic building once thought to be a brothel, owner Ron French regales guests with tales of its purportedly haunted second floor. It’s a good place to find winemakers sucking down cold American light beers and shooting pool. “This is where they go for their Christmas or end-of-year celebrations,” says French. When French ventures out for dinner, his favorite place is The Hatch Rotisserie & Bar, which serves rotisserie-cooked meats and more. If he wants something “lower key,” you’ll find him at Odyssey World Cafe. “And as far as a steak place, I’ll go to F. McClintock’s,” a classic barbecue joint, says French. Raised in France, brothers Daniel and Georges Daou made a fortune with their work to help hospitals enter the digital age before they started their winery, Daou Vineyards, in 2007. Frequent globetrotting hones their tastes, and they recommend several favorite places around Paso Robles. He’s also a fan of the Italian food at Il Cortile Ristorante, lunch at the Allegretto Vineyard Resort (where parking is easy) and breakfast at Panolivo Family Bistro, which he credits for also improving Paso’s evening scene. He loves Ciopinot Seafood Grille in San Luis Obispo, especially for its selection of Pinot Noir from around the world. You may find the brothers sipping wine by the fire at Hotel Cheval. “It’s a cute hotel bar that’s great for hosting people,” says Georges. For recreation, Georges rides horses near Morro Rock, or drives north on Highway One in his convertible or on his Harley. Though she lives in New York City, Nadia Zilkha visits every six weeks for meetings at Laetitia, the Arroyo Grande winery that her father purchased in 1998. While she frequently travels to Chicago, Atlanta and other cities to market Laetitia’s sparkling and still wines, Zilkha enjoys her Central Coast escapes. “Manhattan is an urban jungle, so what I love most is just experiencing the vineyard, watching the different seasons,” says Zilkha.